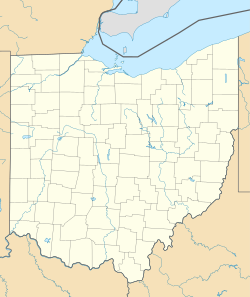 Whites Landing is an unincorporated community and census-designated place in Erie and Sandusky counties, Ohio, United States. As of the 2010 census it had a population of 375. It is located within Margaretta and Townsend townships. Whites Landing is located on the border between Erie and Sandusky counties, on the south shore of Sandusky Bay, an arm of Lake Erie. It is 11 miles (18 km) west of the city of Sandusky and 14 miles (23 km) northeast of Fremont. ^ a b c d "Geographic Identifiers: 2010 Demographic Profile Data (G001): Whites Landing CDP, Ohio". U.S. Census Bureau, American Factfinder. Retrieved March 10, 2016. This Northwest Ohio location article is a stub. You can help Wikipedia by expanding it. This page was last edited on 13 December 2018, at 21:14 (UTC).